This year the Form 2290 is going through two big changes with the way they collect information for Credits on vehicles that are sold during the tax year. First there is something the seller must do, and second something the buyer must do. Many Canadians have been receiving the post card below. To most, this probably isn’t big news. But to a few, and especially with the new FRP plan getting started, it’s a big change. This article is mostly for Canadians – but is probably good advice for anyone who wants to cross the US/Canada boarder. Does That Penalty Notice Look Funny to You? Did you get a penalty notice – but you KNOW you filed, and you KNOW you paid your taxes? Well then you, like many others, may have gotten a mistaken penalty notice. Author Casey JenkinsPosted on September 16, 2014 April 4, 2018 Categories Fleet Manager, News, Owner Operators, Paid Preparer, Working with the IRSLeave a comment on Does That Penalty Notice Look Funny to You? On 9/2/2014 a US Attorney in Florida announced an indictment of a registration service for defrauding owners of large tractor trailers of lots of money. Read the original articles from WTCV and OOIDA. Fraud is easy to understand – it is simply deception. Did you know there is an e-file Grace Period on Form 2290? OK – so it’s not exactly a “Grace Period.” The IRS calls it a “Transmission Perfection Period.” They talk Fancy-Shmancy! It’s happening once again. The IRS is shutting down for Labor Day. The Official IRS Due Date this year is Tuesday September 2nd. But thanks to this shut down – that’s going to be a very tight squeeze. Please try and get your 2290’s done by Friday August 29th by 5:00 PM Pacific Time – before this shut down starts just to be safe. We’re happy to try and help you get out of any penalties and interest – but it’s better if they don’t get assessed in the first place. This happened! A friend of 2290Tax.com painted a picture for us when we moved into our new offices on Route66. How he came up with the idea is a whole other story, but it got me to thinking…why haven’t I ever seen a real stamp like that? I’d buy that stamp in bulk and use it for all our mail – if such a stamp existed! The message is right on – Truckers are “First Class Forever” in our eyes. 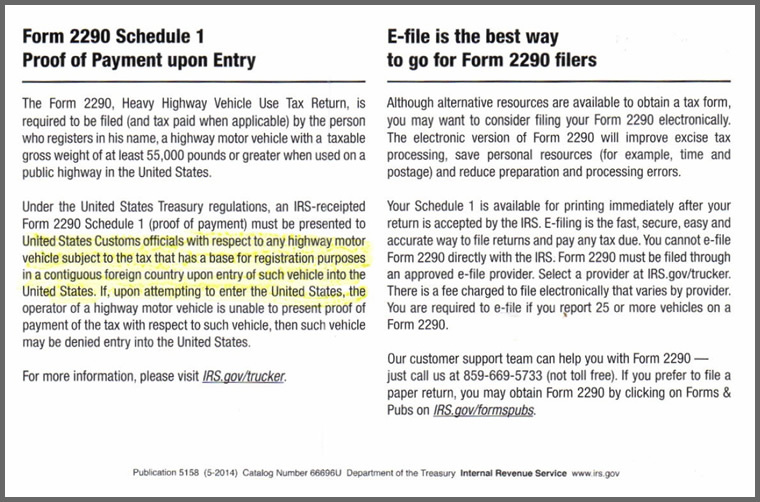 The IRS said they would begin auditing Form 2290, and we’re starting to see it happen when suspended vehicles are reported. It seems the IRS is looking for PROOF that the mileage stayed below the maximum limit, and they are assessing taxes if the documents they want aren’t provided or if the documents provided indicate the vehicle traveled in excess of the mileage limitation. We get tons of Form 2290 questions about how the IRS works and how e-file works. The short answer is that, “it’s complicated.” The long answer is that the IRS has such a big job to do that they need more than one type of computer to get everything done. Below is a simple explanation of just the basics. We’ll only talk about two of the IRS computer systems, and call them Computer A and Computer B.